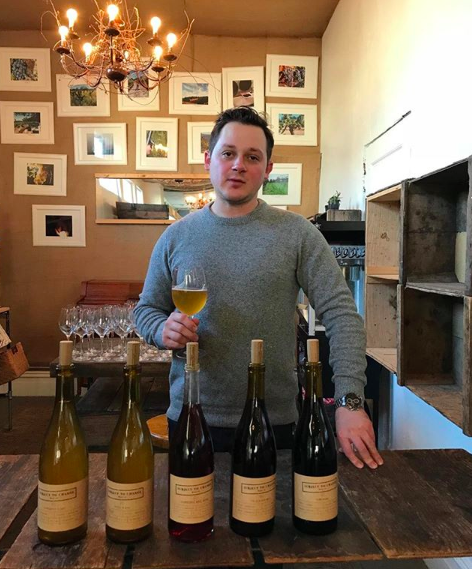 Winemaker Q&A - Alex Pomerantz of Subject to Change Wine Co.
Pictured: Alex Pomerantz of Subject to Change Wine Co.
To start with a broad question: how would you define your winemaking style? Natural, 0/0, nothing added, nothing taken away. This part is going to sound really hippy but the longer I work with wine the more I believe it's important to let the wine find itself, work out it's own issues etc. What I mean by that is that wines go in phases and while I don't believe in letting the wine make itself, I believe in letting it find itself by not over thinking, over manipulating, or judging a wine too soon. We bottled some wines with some extremely high VA and they tasted really weird for a while but the longer they've sat in bottle, the more that's integrated, softened and the more the beauty of those wines has been revealed. Wine is super interesting and complex so it's important not to treat it in a linear fashion. Do you have a favorite winemaking technique? Anything from the sorting table to bottling that you are particularly excited about? Can't tell you all of my tricks - just kidding. We like carbonic maceration and extended maceration although neither is easy to pull off. A lot of our wines are made from multiple components from the same fruit or the same vineyard, each lot with a different technique used and then blended before bottling. This builds layers in the wine and keeps any one thing from standing out but creates a complex and unique final product (ie, different levels of wholecluster or carbonic, direct press lots with macerated lots, elevage in different size vessels or different mediums (oak and stainless). Was there a time you experimented in the winery and it all went horribly wrong? Or perhaps something that turned out better than expected? Both, many times. Also had things that I thought were disasters turn around and pan out, and likewise things that I thought were a layup to make a great wine turn into a disaster. Making wine is very humbling, it takes patience and a good amount of faith that things will work themselves out. I've usually found that allowing things to work themselves out rather than correcting them yields more interesting results, although it's scary. What drew you to natural winemaking? I was interested in learning to make wine as I loved drinking wine and spending time outdoors was looking for a hands-on job where everyday is different. Then I really stated going down the natural wine rabbit hole in 2012 when Ruby Wine opened, the owner is a good friend and I've spent a huge amount of time there drinking wine, meeting producers and importers etc and that really swung my perspective and interests over to natural wine. As such, my winemaking style over time has become increasingly natural to a point where now we make no additions nor subtracts and work exclusively with biodynamic or organic vineyards. What are some myths or misconceptions about natural winemaking? Particularly, stereotypes that don’t apply to your wines? Natural wines are all funky or fucked up - I hear people say this all of the time and it's not true. It's also just one person's point of view because what one person calls fucked up (using an objective lens) another person might think is beautiful. I think the thing that a lot of people like to say is that natural wine makes itself which is definitely untrue. The objective lens is difficult too as judging things as straight up good and bad aims to create a linear scale for a world that's far more complex and less binary. You work with a lot of single vineyard sites, what drew you to focus on this style of production? It's more interesting, it's also a serious part of the essence of wine for me which is capturing a time and place in a bottle. Not that I eschew blending sites, we haven't done that yet but we might in the future because making something delicious is important and can often be done by blending sites. However working with single vineyards gives you a constant (or control) off of which you can work. The vineyards we work with are unique and special so we want to translate that into the bottle with as few factors as possible skewing the expression. Do you have a favorite vineyard to work with? One that produces consistently good wines? Or one that can be finicky but worth it in the end? Can't choose, they're all special in their own rights. The growers are all awesome people, the terrain is often very extreme and really interesting, and they're all equally interesting places to spend time. Is there a story behind the name Subject to Change? Where can our members taste more of your wines? We have a tasting room at 487 25th St in Oakland open Thursday-Saturday. They can also check them out on our website or at the many shops. bars and restaurants around the country that sell the wines. The story is simple, we had to have a name to make a label and get the wine to market. I told my partner that we'd just have to make a label and the name would just have to be subject to change, he said, "great idea," im like, "what" he said "let's call it subject to change, it works well with the natural wine philosophy anyway," and that's how it was born. That's of course not what I actually meant, I meant we'll just call it whatever we call it and that name will be subject to change but his literal interpretation birthed the name (which we're now going to keep indefinitely).